The 6 Best Gibson Pickups – Glorious Gibson Tone! Gibson Pickups: What They Are and What They Sound Like? While Fender’s iconic Telecaster and Stratocaster are synonymous with single-coils, Gibson are the undisputed humbucker kings. In 1946, they developed the acclaimed P-90, before going on to truly revolutionize the guitar pickup – creating the first two-coil humbucker in 1955. This was known as the PAF (‘Patent Applied For’) – a creation that completely changed the face of music forever. But they didn’t rest on their laurels, and instead went on to develop humbuckers of all shapes, sizes and tones. Many guitarists have played Gibson guitars and their awesome pickups, although there are some names that go hand in hand with the brand and their tone. Legendary Gibson players include Les Paul (naturally…), Jimmy Page, Slash, Randy Rhoads, Zakk Wylde, Frank Zappa, Derek Trucks, Tony Iommi, and Angus Young in particular. If you buy a higher-end Gibson, chances are you won’t want to change your pickups because they’ll already rock! However, for those with entry-level or mid-range models, or those players who just fancy a change, a new set of Gibson pickups can bring any guitar to life. So we’ve put together a short chart to highlight some of the most popular Gibson pickups on the market – P-90s and humbuckers – to give you a flavor of what’s popular at the moment. Then stick around for a guide to everything you need to know about Gibson pickups. A stylish neck P-90 with beautiful balance. A hot ceramic humbucker that’s a rock legend. Authentic fifties PAF tones on offer with this iconic Gibson humbucker. Undoubtedly the hottest humbucker on this chart! True grit from this impressive Seymour Duncan P-90. Vintage Firebird tones with this Seymour Duncan mini humbucker. We start our chart with this excellent P-90, which is ideal for those chasing that growly vintage single-coil tone. However, Gibson’s P94R neck pickup doesn’t require a complete electrical overhaul or any modifications to your prized axe, sliding comfortably into any humbucker slot. A good-looking pickup that comes in several styles, the P94R features an Alnico V magnet wrapped in enamel-coated vintage wire, to deliver an authentic P-90 sound – rich and warm, with classic treble bite and single-coil sparkle. The only trade-off is a little excess noise. But overall, it’s an excellent bluesy lead pickup, and it works wonderfully with the matching P94T bridge pickup. Or match it with a hot humbucker for a guitar with huge versatility. For searing hot lead tones, albeit with a little less intensity than the Dirty Fingers we feature below, the classic Gibson 500T humbucker is a smart choice for aggressive led players. Made with a ceramic magnet, the 500T has been the go-to choice for rock guitarists for decades, as it offers an incredibly powerful output, with the clarity of a diamond and lengthy sustain. While it cleans up very well, it’s with a huge dose of gain that the 500T really performs and is the perfect tool for hard rock and metal – both classic and modern – with an enhanced low-end and sparking highs. It’s well-worth pairing with its brother, the 496R in the neck, for an all-round Gibson tonefest. The ’57 Classic Plus is a true legend when it comes to Gibson pickups and found fitted on many high-end Gibson guitars. They aren’t the cheapest pickup on this list, but the ’57 is a versatile humbucker that really can rock, and delivers full vintage tones that mimic those of the original fifties PAFs. It uses a special Alnico II magnet that’s slightly overwound with vintage enamel-coated wire to give a relatively high output, although the focus of this pickup is on producing true-to-the-time sounds. Whatever your amp settings, the ’57 remains smooth when played cleanly or with high gain, and can produce a delightfully saturated crunch. Note this humbucker comes both covered and uncovered in several styles. Loud? Aggressive? It has to be Dirty Fingers! Although it took a bit of a hiatus after its first airing in the 1980s, this legendary humbucker is back (thanks in part to Blink 182’s Tom DeLonge, who uses them on his signature Gibson ES-333 [INSERT LINK to https://www.amazon.com/Epiphone-Delonge-Signature-Semi-Hollowbody-Electric/dp/B0011FUIPA/]). And it’s as hot as ever. Available for the bridge only, Dirty Fingers features an overwound ceramic magnet, which offers an extreme output, biting crunch, and awesome sustain that’s essential for heavier musical styles, although it remains surprisingly clear, even at the highest volumes. While the cleans are fine, it’s with high-gain this pickup really performs and can turn even an affordable axe into a rock monster. Thankfully, with all the high-volume playing you’ll be doing, Dirty Fingers is wax-potted to limit squeal. Here’s some proof that you can have a great Gibson-targeted pickup that’s not made by Gibson – this excellent PhatCat from Seymour Duncan. It’s a popular P-90 that works equally well in the bridge or neck positions, and offers a true vintage growl. 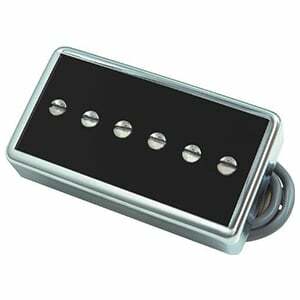 With a nickel or gold cover, the soap bar pickup is handmade in California, using Alnico II magnets, and offers crisp cleans with plenty of attitude when the gain is cranked up. Chords ring true and it cuts through the mix well with great sustain, so is versatile for both lead and rhythm playing. It’s still a single-coil, so a little noisier than some others on this list, but it is wax-potted for no feedback. Let’s hear that Phat Cat roar! This awesome mini humbucker – the SM1-N from Seymour Duncan – is an ideal way to get true original Gibson Firebird tones into an affordable guitar. With an impressive sound when both clean and distorted, this mini humbucker feels well balanced, with a sparkly bite and a tight low-end found on your typical full-sized humbucker. Its best-of-both-worlds tonal output makes this mini humbucker a very versatile pickup, and is ideal for blues playing. Made with an Alnico V magnet and featuring a chrome cover, it fits comfortably into the neck position, and naturally pairs well with an SM1-B in the bridge. While it’s not the easiest on this list when it comes to installation, for the price the SM1-N offers very good value. Of course, we start with the classic P-90. This is a single-coil pickup, although sports some qualities of a humbucker. P-90s have a similar construction to the classic Strat single-coil pickup, but are made with larger, flatter coils, along with a flat alnico bar magnet under the coil bobbin (instead of magnetic pole-pieces). P-90s offer a unique, versatile tone that is adored by audiophiles – vintage in feel, with a chunkier sound than a single-coil and more clarity and spark than a humbucker. While the original PAF no longer exists – taken out of production in 1975 – Gibson still manufacture a big range of pickups that offer the true PAF tone, including the ’57 Classic and Burstbuckers. There are three versions of the Burstbucker, all described by Gibson as ‘time machines’. These humbuckers really do offer the much-desired classic tone of the late fifties, varying in output – Burstbucker 1 is underwound to provide a medium output, Burstbucker 2 is a little hotter, while Burstbucker 3 is overwound for huge tones! The ’57 Classic is another popular model and isn’t too different to the Burstbucker, providing that delightful classic PAF tone, with ample richness. The focus is more on vintage than delivering the edgy tone that Burstbuckers offer. Gibson also produce a big range of humbuckers for the modern player, such as the 490R and 490T, and 496R and 500T humbucker pairings – the latter pairing in particular offering a considerably higher gain that’s perfect for heavier rock and metal guitarists. Then you have their ultra-aggressive Dirty Fingers, which takes output to a whole new level. Created by Gibson subsidiary Epiphone in the late 1960s, the mini humbucker is exactly what the name suggests – a smaller, more compact humbucker with a narrower magnetic field that will fit into a P-90 slot. Made famous by the Gibson Firebird, mini humbuckers produce a bright, focused sound, and are pretty well balanced between a single-coil and humbucker in the tonal spectrum. You’ll find Gibson’s range of excellent pickups used across their guitar series. For example, the Les Paul Classic T 2017 is loaded with a pair of ’57 Classics. On the SG Special HP 2017 you’ll find both 490R and 490T humbuckers, and on the Firebird T 2017 sits a pair of mini humbuckers. Gibson pickups are therefore incredibly versatile and found in pretty much every area of music, from classic rock and heavy metal, to jazz and blues. We’ve established that there is no one-description-fits-all when it comes to Gibson pickups – they are a broad family, covering both single-coil and humbucker, medium and high output, and vintage and modern tones. However, we hope our chart and guide has given you a little inspiration when looking for a new set or individual pickup for your guitar – whether it’s a Gibson, Epiphone or something completely different. Make sure to read plenty of reviews and watch some videos of your shortlisted pickups, to give you a clearer idea of how they sound. Then buy them, fit them, and enjoy them!